Whether you’ve decided it’s time to bail on Flickr and no longer want to use the service or it’s the only place you’ve saved some of your photos, backing up your Flickr photos couldn’t be easier. Whether using native Flickr tools or a third-party app, you can download the photos you’ve uploaded at their original resolutions. If you need to download just one or two of your photos, you can do this by logging into your Flickr account and navigating to the images in question. Click the download button beneath the image and you’ll see a list of image sizes available: square, small, medium, large, and original. To download the largest possible image, select Original. You can change the file name and select where the image will be saved on your computer. If you’re thinking of ditching Flickr in favor of another photo hosting site and have been using it for a while, you’re not going to want to download each image one by one. There are a couple of ways you can bulk download high-resolution Flickr photos — either through the Flickr site itself or using a third-party app 3 Awesome Tools to Download Flickr Photos & Sets 3 Awesome Tools to Download Flickr Photos & Sets Although many people now use Facebook or Google's Picasa to share and backup photos online, there are still plenty of people who prefer to keep on using Flickr for one reason or another. Read More . On Flickr, you can batch download images either from the Albums page or from the Camera Roll page. If you’ve organized your photos into Albums, you can download an entire album by clicking the download button. The photos will be downloaded in a ZIP file. If you head over to the Camera Roll, you can see your photos divided either by when they were taken or by what Flickr calls Magic View, where photos are automatically categorized for you. With one click, you can select all images under one date or one category. If you don’t have too much uploaded to Flickr, you can easily select all your images and download them in one ZIP file. 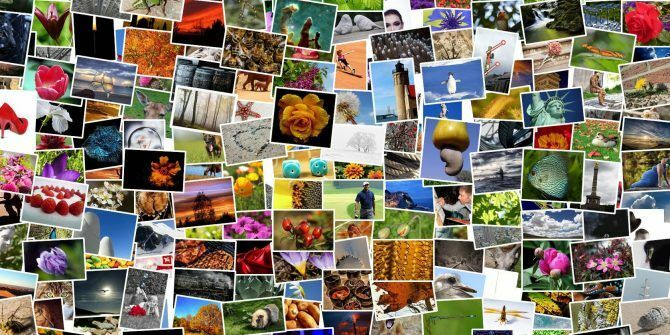 There are quite a few third-party apps out there for bulk downloading Flickr photos, but one of the easier and more reliable options is Bulkr. When you install Bulkr, you’ll also need to install Adobe Air (no worries, it’s wrapped into the Bulkr installation process). Once you’ve connected the app to your Flickr account, you can bulk download your entire photo stream as well as albums and favorites. Download choices include the image size (small, medium, and large) and where the photos will be saved. If you want to download original resolution images using Bulkr, you’ll need to upgrade to the pro version of the app for $29 a year. There are a few small caveats to keep in mind when using Bulkr. The app will occasionally lose its connection to the Flickr servers, but you can just click to reconnect — but that also means you’ll have to keep checking in on the process. And if you want to stay organized, you’re going to need to rename the files once they’re downloaded to your computer. Are you sticking with Flickr or jumping ship? How do you backup your Flickr photos? Let us know in the comments.